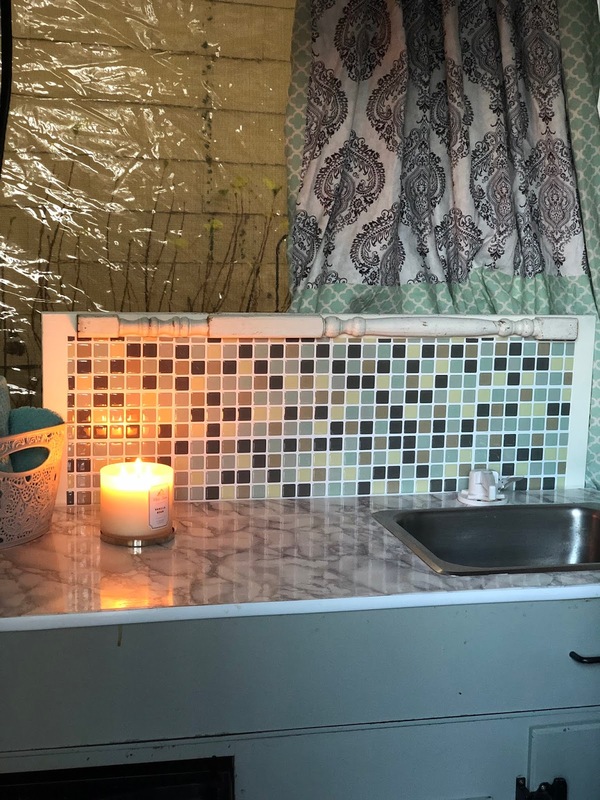 My completed pop-up camper backsplash. 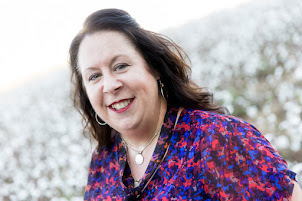 I'm starting the new year with a series called "Spruce Up for Spring." 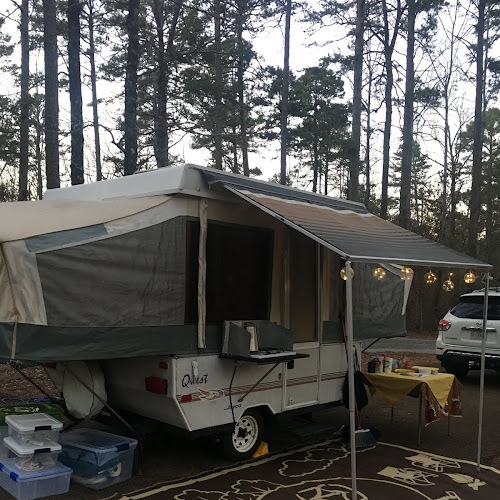 Each month, I'll share a different project for your camper. Over the past 2 years, I have scoured the Internet for a good backsplash tutorial. 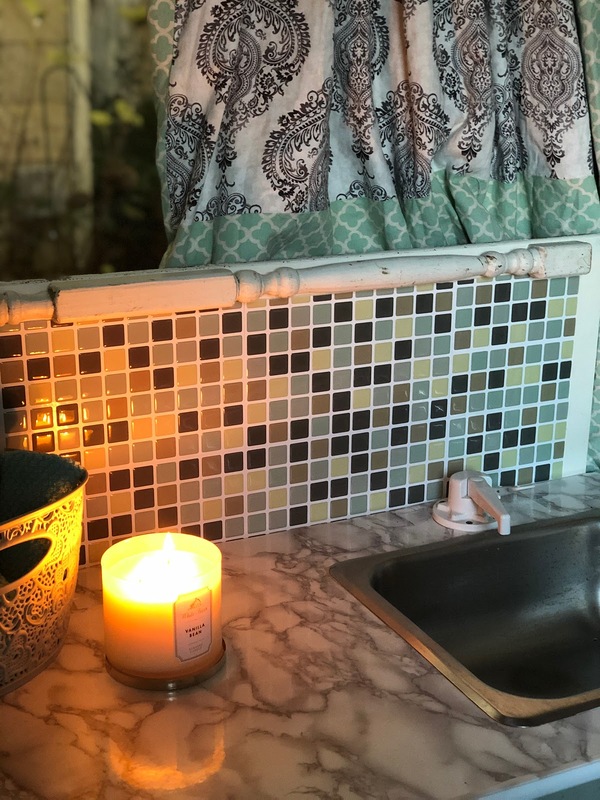 I came across articles showing how to dress up an existing backsplash or beautifully staged photographs with no instructions. I couldn't find the concrete directions to build a backsplash from scratch, so I decided to figure it out on my own. 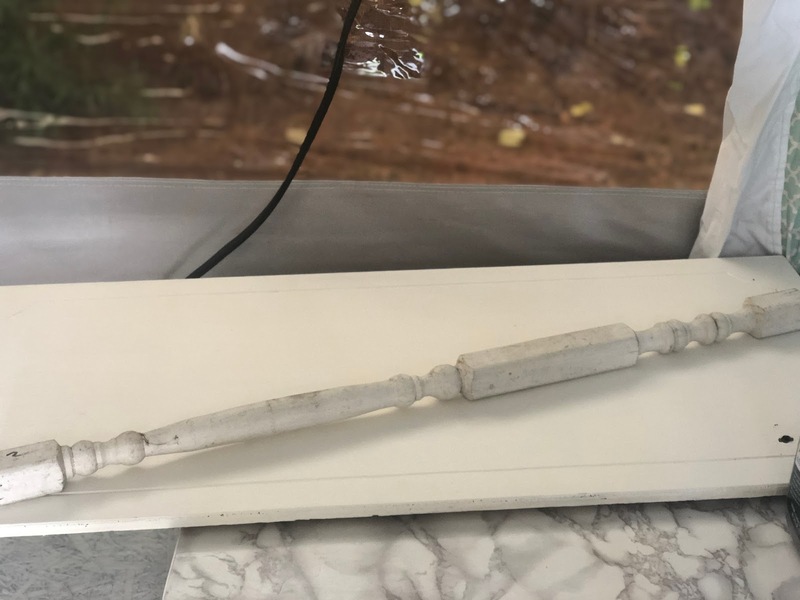 You can be as creative as you like with this project I started with an old cabinet door and a spindle from a junk store for $10. However, you can cut a piece of wood to fit your space. It is up to you. I like the repurposed door because some of the work is already done for me! It is painted and weathered. It gives a farmhouse look that I love. Wood for your backsplash - An old cabinet door or wood piece you cut for your space. Peel and Stick Tiles - I used Tic Tac Tiles. 5-inch barrel bolt hardware - These are from National Hardware. A long narrow piece of wood to connect your backsplash to the countertop. I used a 1 x 3 that was cut to fit. Measure and prep the wood for the backsplash piece. Remove any existing hardware from your cabinet door if this is your selected piece for your project. I had a doorknob and two hinges to remove. 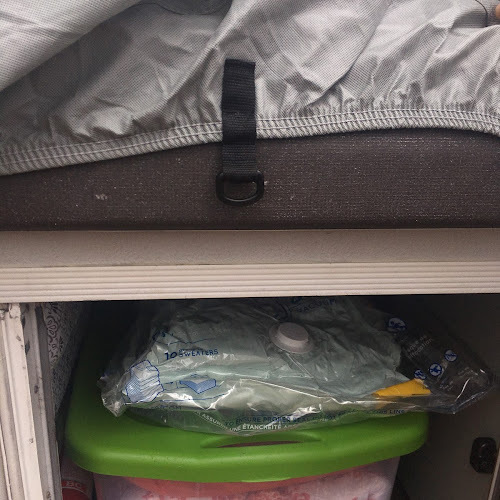 I cleaned the door with Thetford Kitchen and Bath Cleaner and let the cabinet door dry. Remove the hardware from the door using a drill or screw driver. If you are cutting a piece of wood for this, you may want to paint or stain your wood. 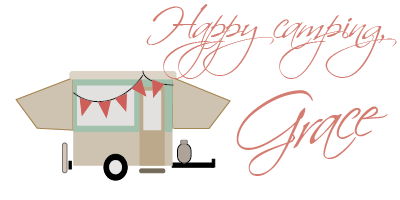 Choose a color or stain that would fit in with your camper decor. Neutral paint or stain with colorful tiles would really stand out. My cabinet door is worn and aged over time. This weathered look is just right. A good wash and dry was all that it needed. The wood spindle and door cleaned up nicely. While your backsplash board is drying (from painting or washing), measure the thickness of your backsplash piece. Then, measure how much overhang from the back of the countertop to the underside is. For me, the cabinet door is 3/4 of an inch thick. There is 1/4 inch from the edge of the countertop to the underside of my counter. 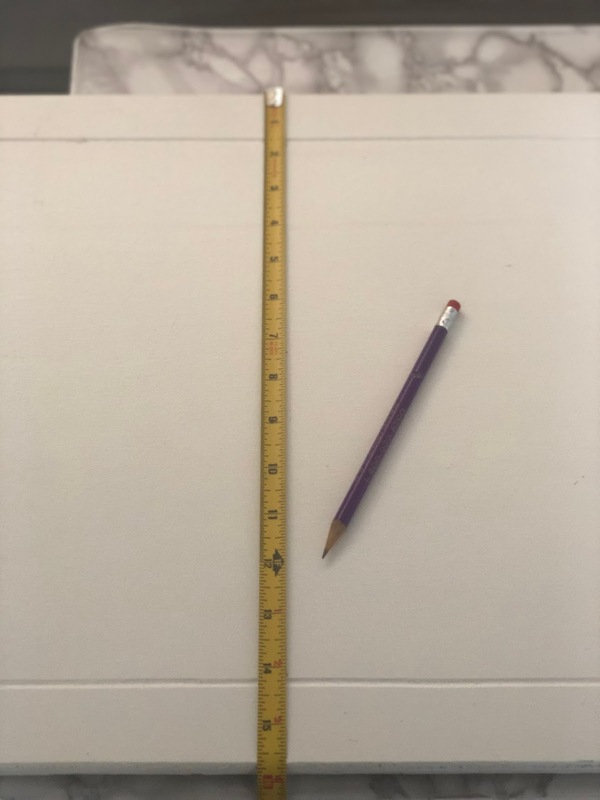 So, I need a piece of wood that is 1 inch thick to put behind my countertop that the backsplash will connect to when finished. See the pictures below to see this diagram. 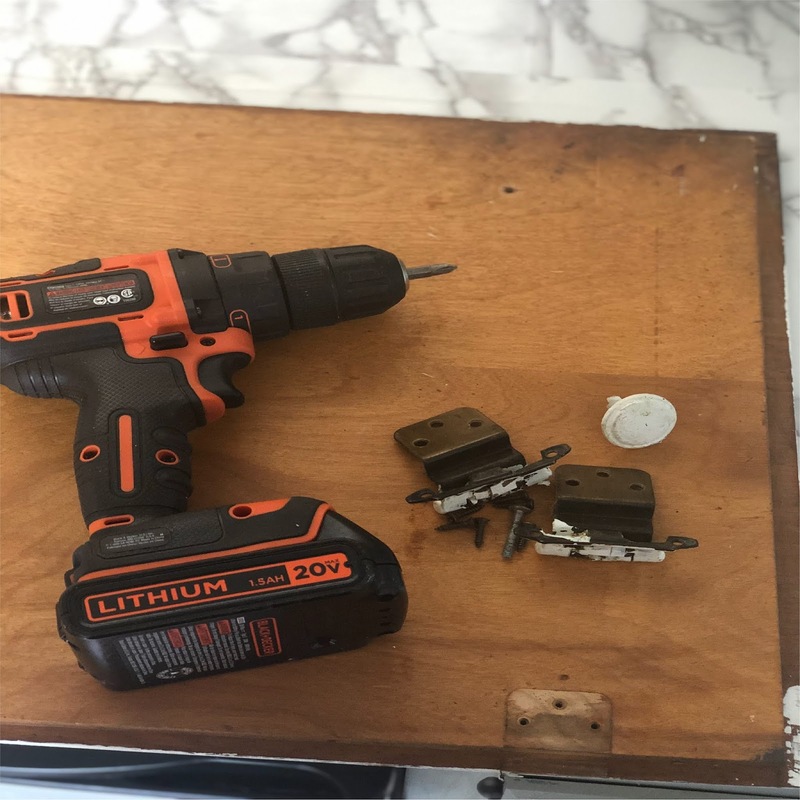 If you need a little more depth, you can add little washers or spacers between the countertop and connecting board. 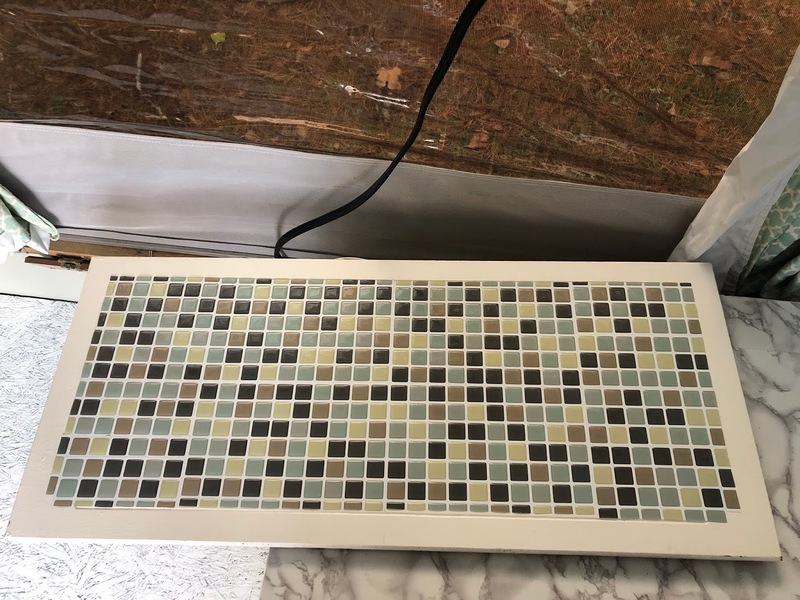 The main goal here is to have a backsplace piece that sits flush with the connect board when placed against the back of the countertop. I hope this makes sense here. The back view illustration gives a look at the overall plan for the backsplash. Measure the backsplash piece length and heightwise and mark the halfway point for each. Draw lines through each of these measurement points. This should dissect your board into quadrants that you can use to lay out the tile. 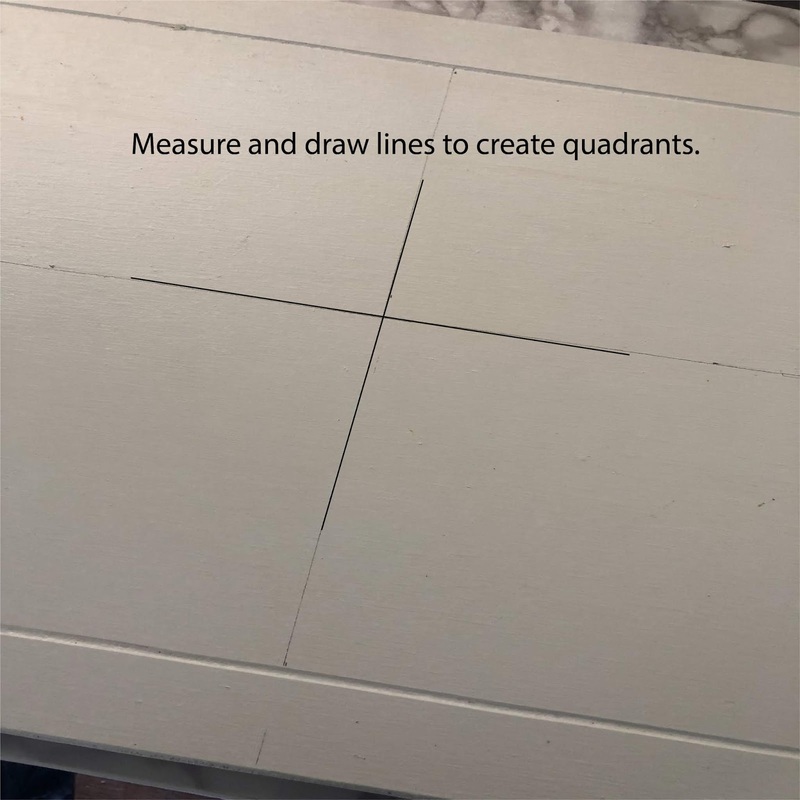 Measure and mark your midpoint lines. The quadrant will give you the lines to lay your peel and stick tile. I chose to lay my tile just inside of the door's contoured lines that were already there. You can decide how much to cover. However, I used one pack of Tic Tac Tiles that had 5 squares to cover a door that was 35 inches long. If you have a longer piece, you will need at least two packs of tiles. Start working by working with tiles to cover the matching quadrant points in the middle. Work outward from those points. 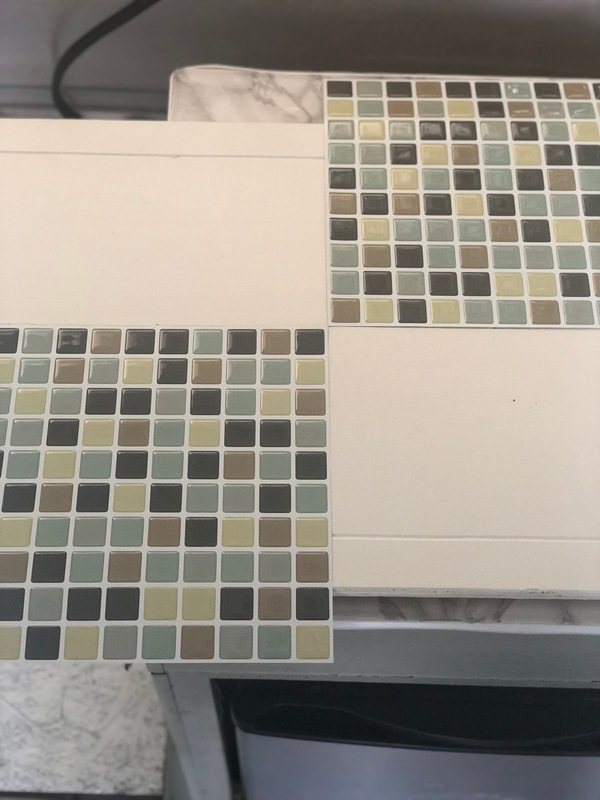 You will want to lay out your tiles and position them so that you can cut them accordingly before you start to peel by the adhesive backing. The peel and stick tiles should be started and the quadrant points in the middle. Trim as needed for the space you have. Continuing cutting and sticking the tiles down to fill in space. Work carefully and take your time so as not to make mistakes. When you are cutting, use the "grout" lines on the tile as a guide so that you can cut the tiles to match. 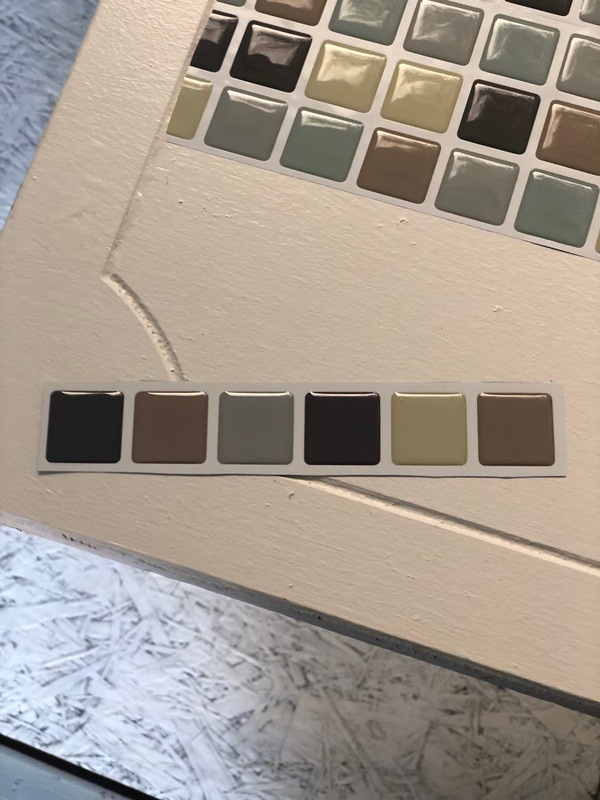 Trim pieces to fit into the backsplash using the grout lines to guide you. The filled in backsplash is now ready for hardware. When you are finished covering the backsplash, you can use wood wax to seal any exposed wood. I used the wood wax along the wood border and edges. I'm placing this backsplash behind my sink. I want to ensure that the wood is waterproof. With the front of the backsplash finished, it is time to add the hardware. Turn over the backsplash. Align the backsplash with the wood connecting piece that you will fix to the bottom of your backsplash. I used 4 5-inch barrel bolts to hold my backsplash in place. Line up each of the barrel bolts along the backsplash and wood holding piece. Line up the barrel bolts along the edge of the backsplash. Mark your wood at each point where you will screw in the pieces and drill pilot holes so you don't split the wood. Screw in the hardware into the holding piece first. This will be the small end of the barrel bolt. The small end of the barrel bolt will be added to the wood connector piece. The large part of the barrel bolt will be added to the main backsplash piece where you have added the tile. Next, attach the top of the barrel bolts into the backsplash itself. Mark where each piece will go. Drill pilot holes for each one. Then attach with wood screws. Test each bolt to make sure that everything aligned properly. It is important to take your time here so as not to make mistakes. Each piece will have to line up exactly for the backsplash to attach properly. I used 5-inch barrel bolts for this because my backsplash made from a cabinet door is heavy and tall. I wanted to ensure that I had enough strength to hold the weight of the door. 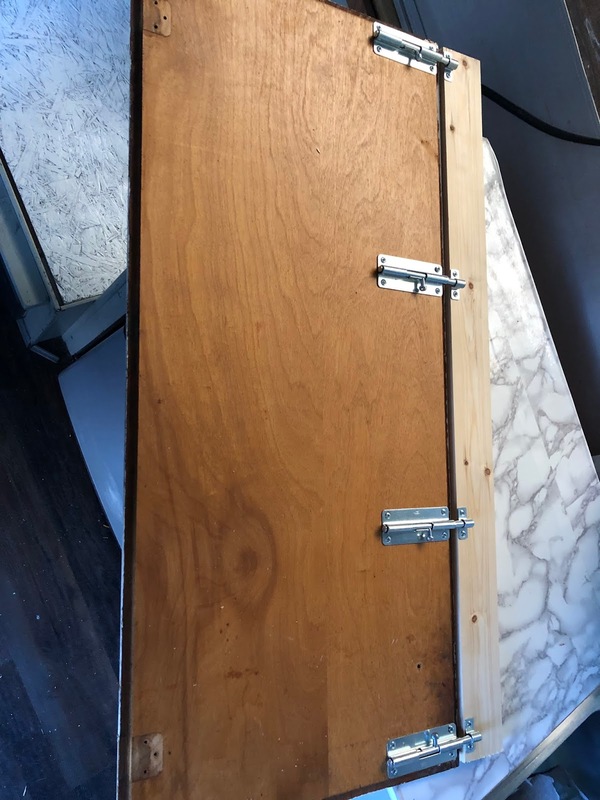 Now you are ready to attach the wood connecting piece to the bottom of your cabinet. 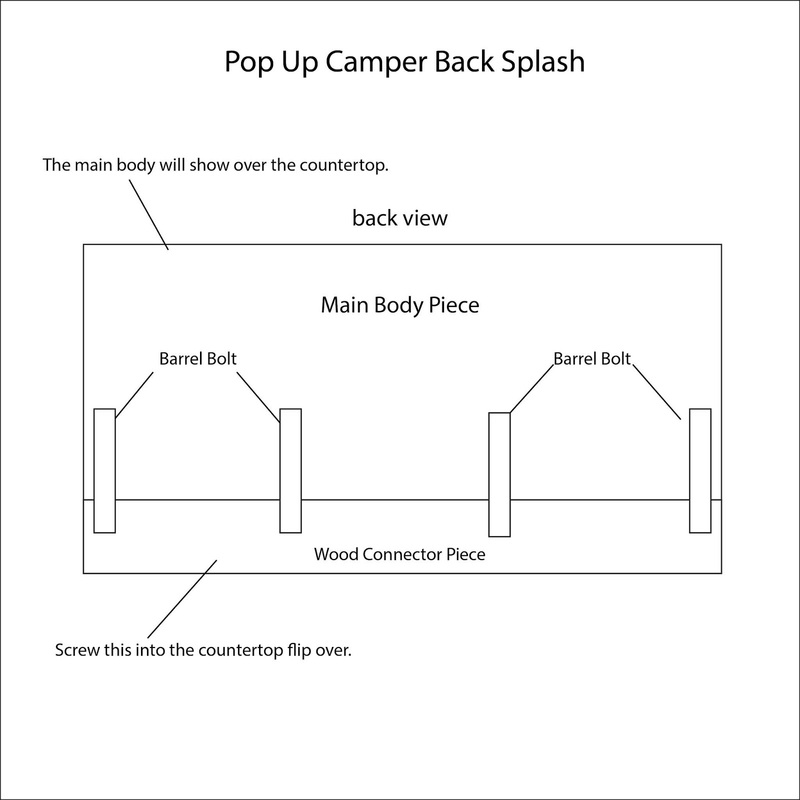 When you flip your sink over in your pop-up up camper, you are going to attach this wood piece along the very bottom aligning the edges. The top of the barrel bolt connectors should be at the top of the wood or facing away from the bottom edges of the place you are working. 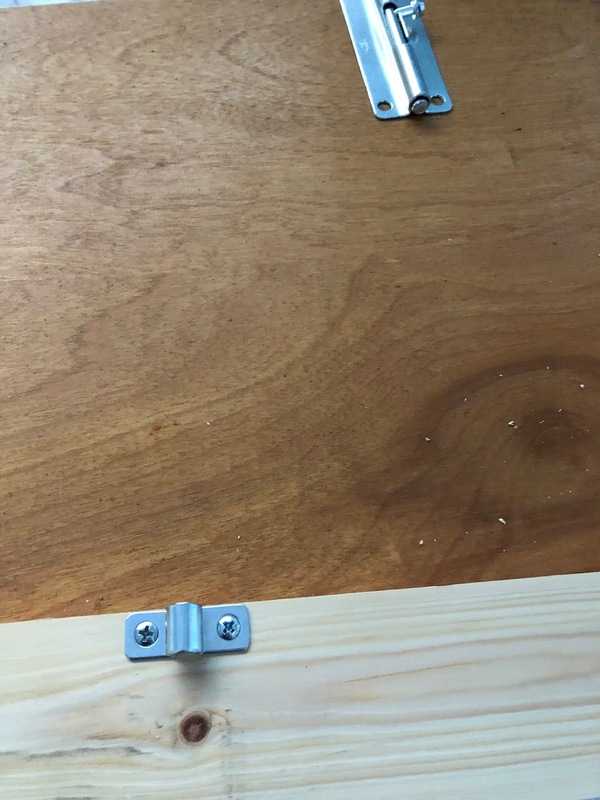 Using wood screws, you are going to attach this wood connecting piece into your countertop on your pop up. Make sure that your screws are the right length for your board thickness. Since I had a 1 x 3 board, I selected to use 1 1/4 inch wood screws. When you flip your sink back over. Now you can slide the barrel bolts into the place and secure your backsplash. Tada! You are done. The backsplash should fit securing behind your counter with the barrel bolts holding it upright and in place. The only other thing that I did to my backsplash was added the wooden spindle at the top. This was just an architectural detail that I like. But, it is not necessary. I love how this turned out. I have wanted a backsplash for a long time, and now I have one! The finished backsplash has a farmhouse look and unique style. This project took a couple of hours to do. I'm not super skilled but was able to easily do this on my own. The longest part of this project was having a board cut at Lowes! You can complete the project in an afternoon if you have all your supplies ready to go. 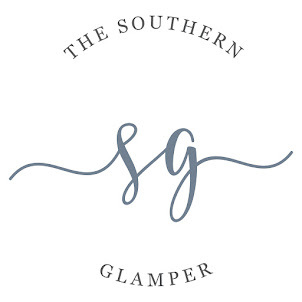 If you are looking for more projects for your camper remodel, check out my Projects Page for more inspiration. You can also find me on Pinterest. If you complete this project, I'd love for you to share it on social media. 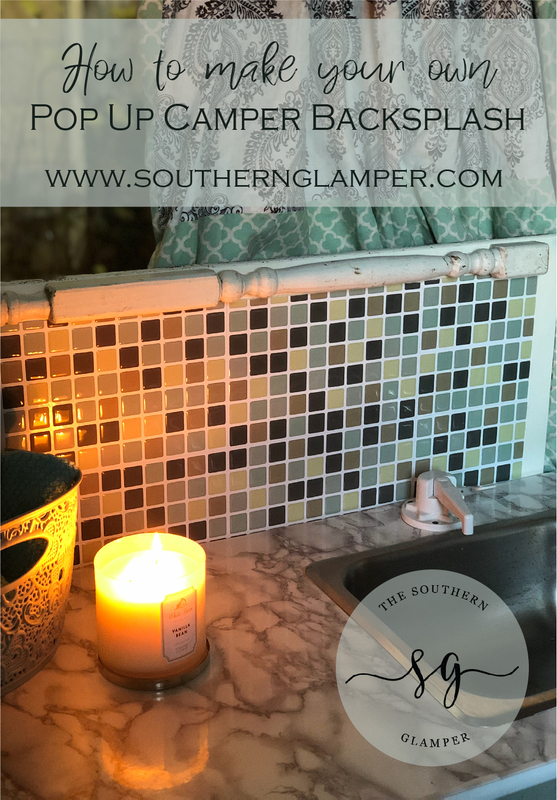 Tag me with #southernglamper to show off your backsplash or other DIY camper projects. 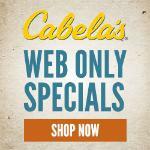 Be sure to pin this post to your favorite Pinterest Board.